TOKYO (AP) — Shohei Ohtani says it didn’t take him long to realize he was competing at a much higher level during his first season in Major League Baseball. 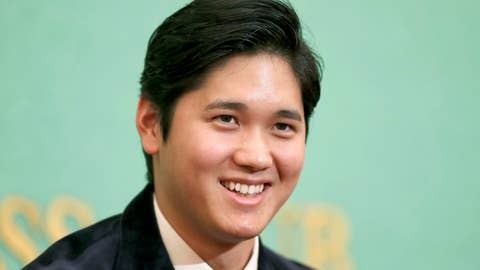 Ohtani returned to Japan and held a news conference at the National Press Club, where he spoke at length on his first season with the Los Angeles Angels. Ohtani won American League Rookie of the Year earlier this month despite an elbow injury that disrupted his switch from Japan to the major leagues and likely will prevent him from pitching next year. He didn’t play between June 4 and July 3 because of a sprained ulnar collateral ligament in his right elbow, an injury the Angels were aware of when they signed him last winter. The 24-year-old right-hander had Tommy John surgery on Oct. 1 and hopes to be able to help the Angels at the plate next season. He probably won’t take the mound again until 2020. In an indication that he plans to continue both pitching and batting, Ohtani said having surgery made the most sense. As a pitcher, Ohtani was 4-2 with a 3.31 ERA and 63 strikeouts over 51 2/3 innings in 10 starts. As a designated hitter, he batted .285 with 22 homers and 61 RBIs and a .925 OPS in 367 plate appearances. Ohtani was also asked about the 2020 Tokyo Olympics, where his sport is making a return after being dropped after the 2008 Beijing Games. Players from MLB are unlikely to take part as the league has said it will not shut down its season for the Olympics. The questions weren’t all game-related. On a lighter note, Ohtani said he has no immediate plans to get married and that he won’t be able to give an acceptance speech in English for his Rookie of the Year Award.